Summer Scorcher Leagues are OPEN! The Summer Scorcher Leagues are OPEN for High School and Middle School! Games Start June 5th! The deadline to register is May 15. Please see the links to the right to register. Equipment Store for boys and girls of all experience levels. Discounted prices. Next Clinic is Saturday, April 27th, at Northgate HS! Congratulations to all the new players enjoying and learning lacrosse! Thanks for attending the "Learn-To-Play" clinics we have had so far this winter, and this past fall and summer. Stay tuned for more! Now is the time to register for Spring Lacrosse ! We are expecting 300 players and the work has begun to make sure all of our players and parents have a great season! Register Now to insure your spot! ​​​​​Early Registration Discounts for Spring through Friday Nov 30, 2018! Oct 11, 2019 Spring Boys Youth League Registration Opens! Oct 10, 2019 Spring Girls Middle School League Registration Opens! Oct 8, 2019 Spring Middle School League Registration Opens! For more information on our leagues, please click the "Leagues" Header above, thanks!! 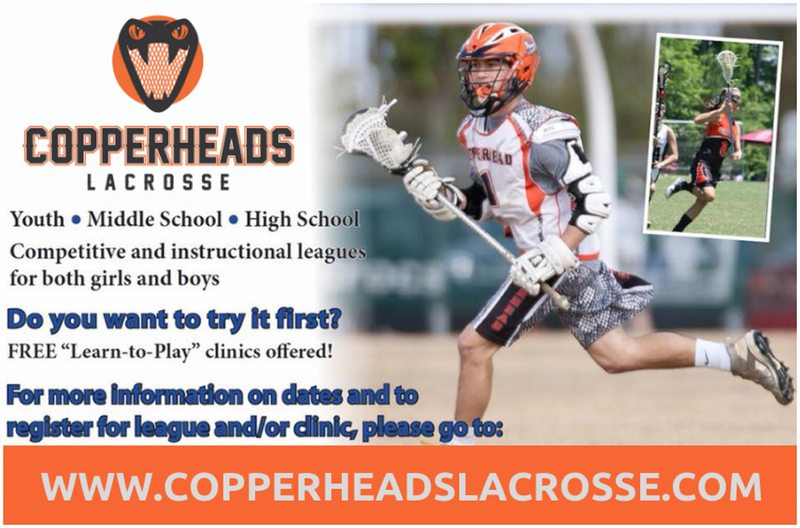 At the end of the 2019 Spring season The Southern Crescent website will move to Copperheads Lacrosse. Southern Crescent has always been a division of Copperheads, and we are making an easier, single, location for everyone. ©2019 Southern Crescent Lacrosse / SportsEngine. All Rights Reserved.